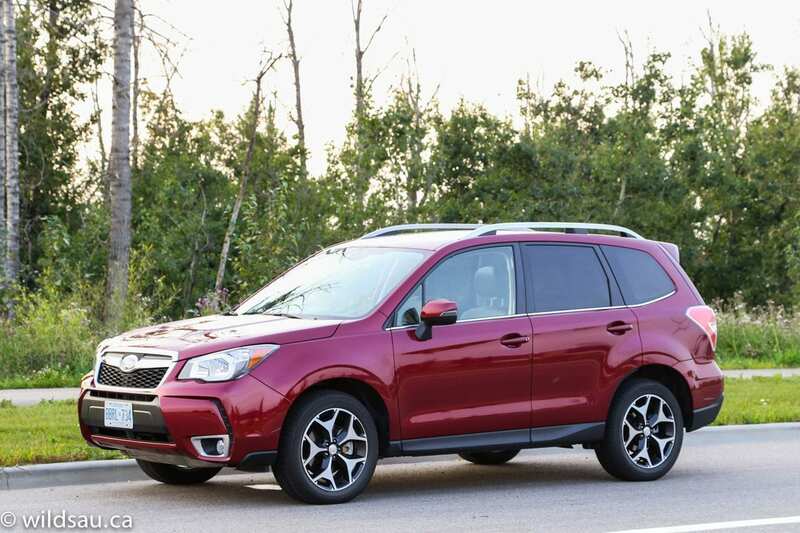 The Forester is a critical piece of Subaru’s sales pie. It made up 23% of their sales last year. 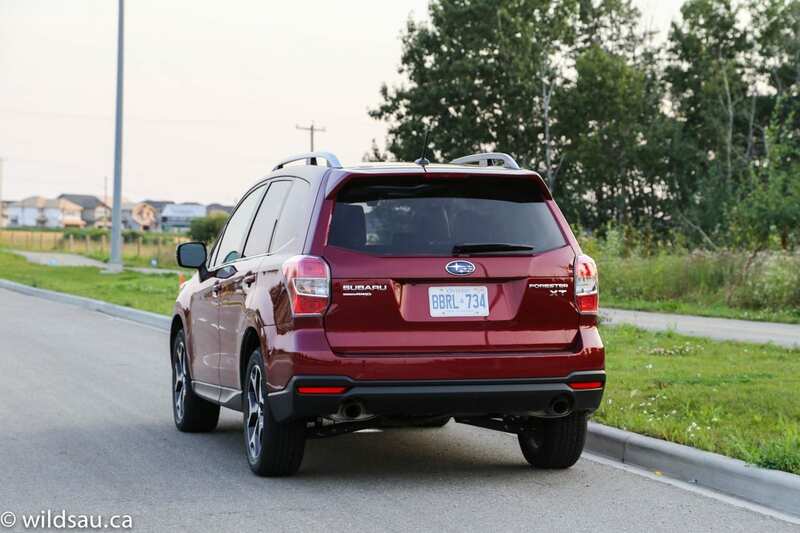 They’re hoping to continue seeing success with the all-new 2014 Forester, which is longer, wider and taller than the last model. 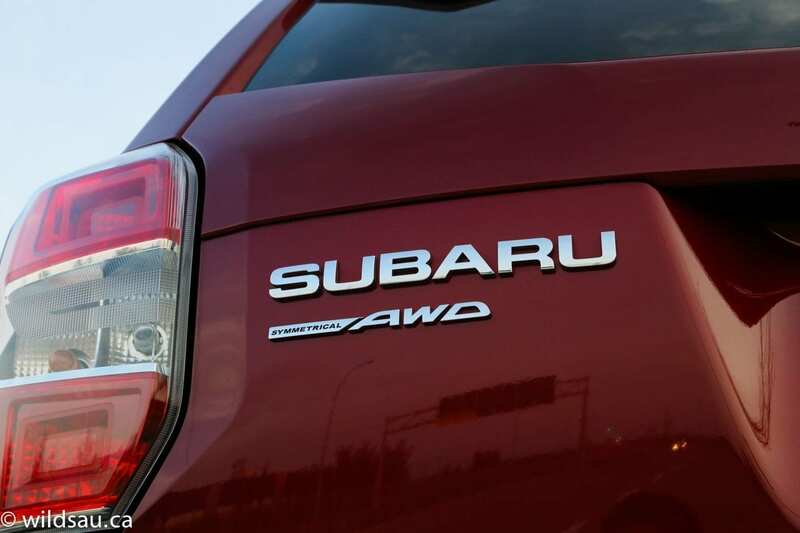 Subaru makes no bones about it – they’re positioning it as an SUV these days. Does it have the chops to deliver on that positioning? 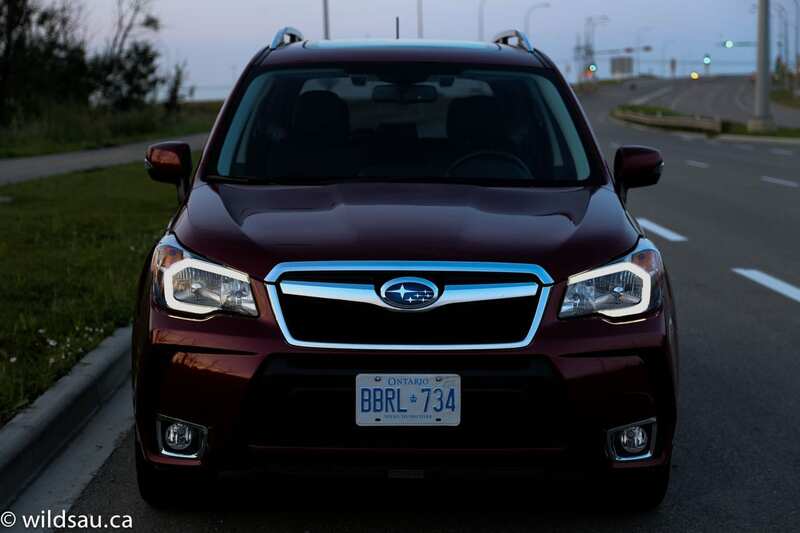 If you know your Subarus, you’ll find the Forester instantly recognizable. But the update is a nice one, and the XT adds a few aggressive touches – especially at the front end with its lower side intakes and in the wheel wells, which are filled with lovely 18-inch rims wearing 225/55-sized rubber. Though freshened up, the lines remain clean, straight and business-like. 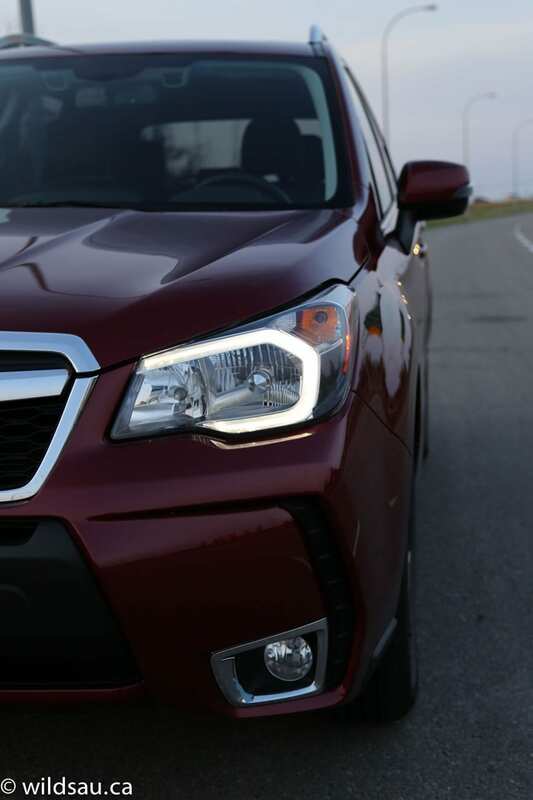 As it’s coming toward you, the XT glares with cool LED accent lighting, and at night, the HID headlights look great and do a good job lighting the landscape ahead of you. 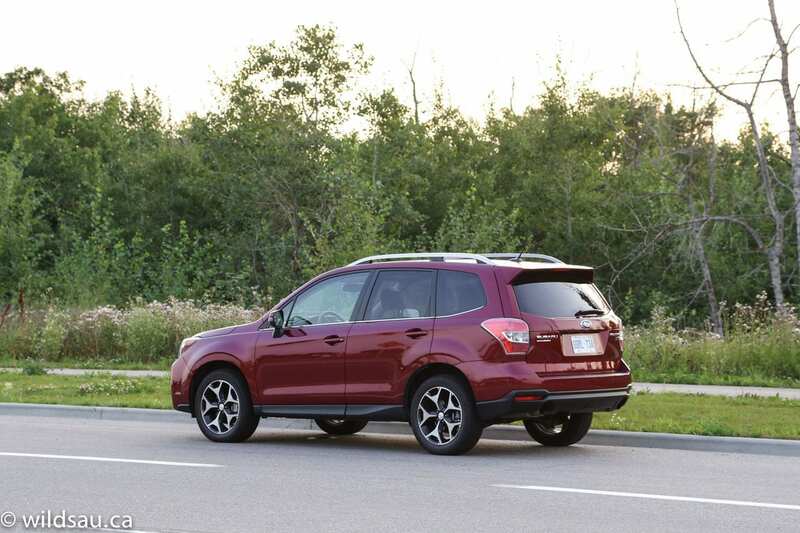 It’s tough to explain, but somehow, the new Forester has a more planted appearance when it’s on the road. That might have to do with the additional width. 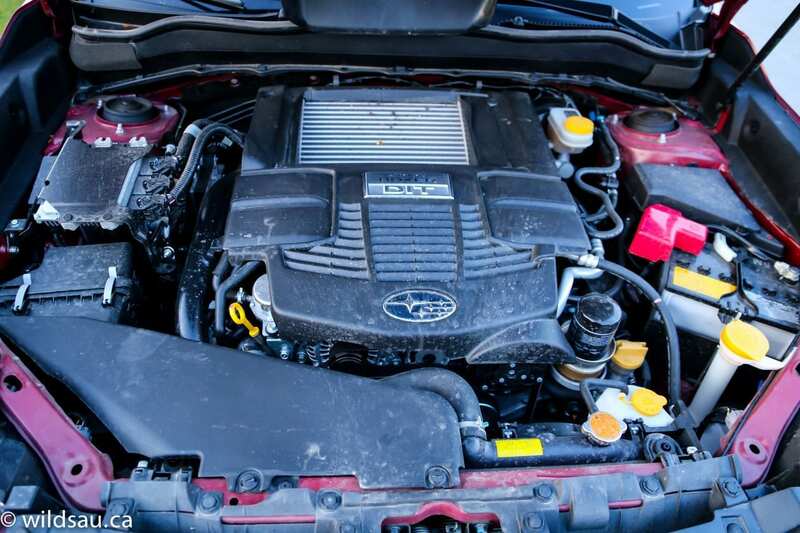 It wouldn’t be a Subaru if it didn’t have a horizontally-opposed boxer engine under the hood. The XT gets Subaru’s new 2.0-litre 4-cylinder direct injection boxer with an intercooled twin-scroll turbocharger. 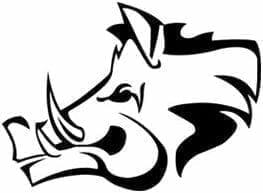 It ramps up the power to 250 horsepower at 5600 rpm and a juicy 258 lb.ft of torque that’s available to you from 2000 all the way to 4800 RPM. 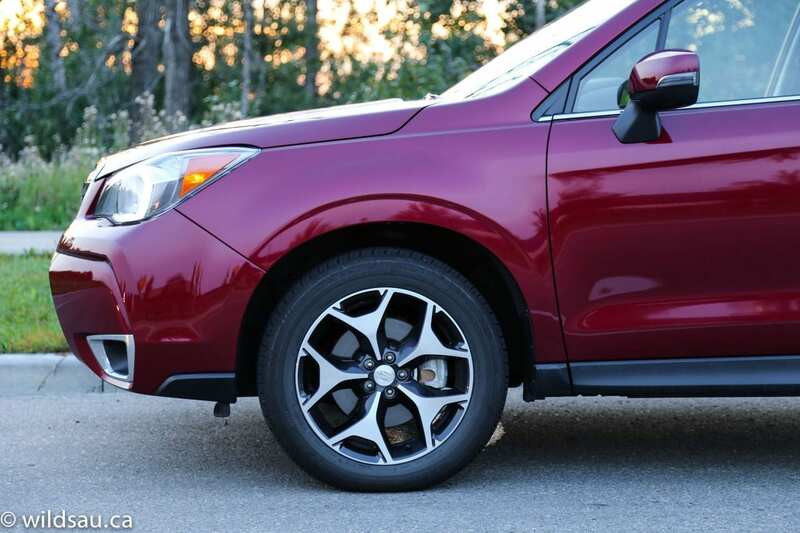 CVT haters will be saddened to find just that – a CVT – as the only option for the XT. I’m here to tell you it ain’t bad at all, and I’m no fan of CVTs. But more on that later. 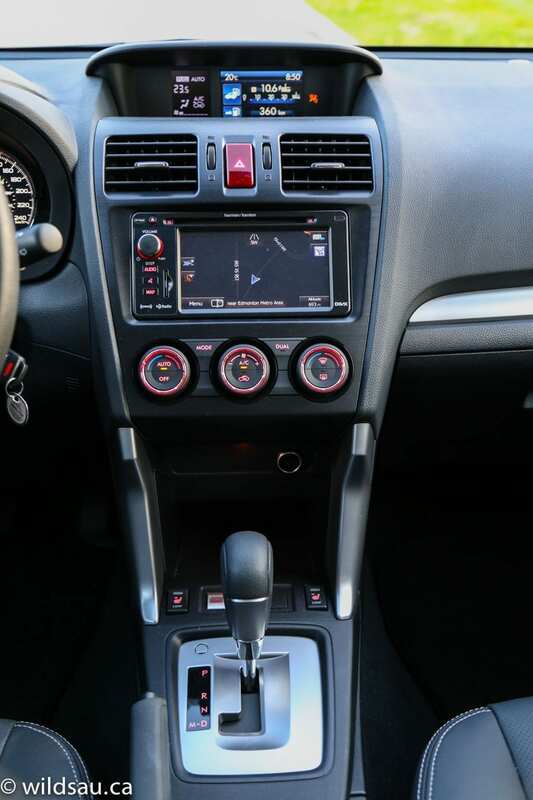 The Lineartronic CVT has a manual mode, and you can also access two different sport programs. One is called SI mode, which makes the transmission feel like it has six speeds and the more aggressive S# (sharp) mode bumps things up to eight pre-programmed ratios. Essentially these modes simulate 6- or 8-speed automatics. Of course, the power makes its way to all four corners through a symmetrical all-wheel drive system. Fuel economy is rated at 8.9 L/100 km (26 mpg) in the city and 7.2 L/100 km (33 mpg) on the highway. I averaged 10.6 L/100 km (22 mpg) during my week with it. That was mostly slow city commuting, and when I had the space, I drove it hard. More about that later as well. The tank holds 60 litres. 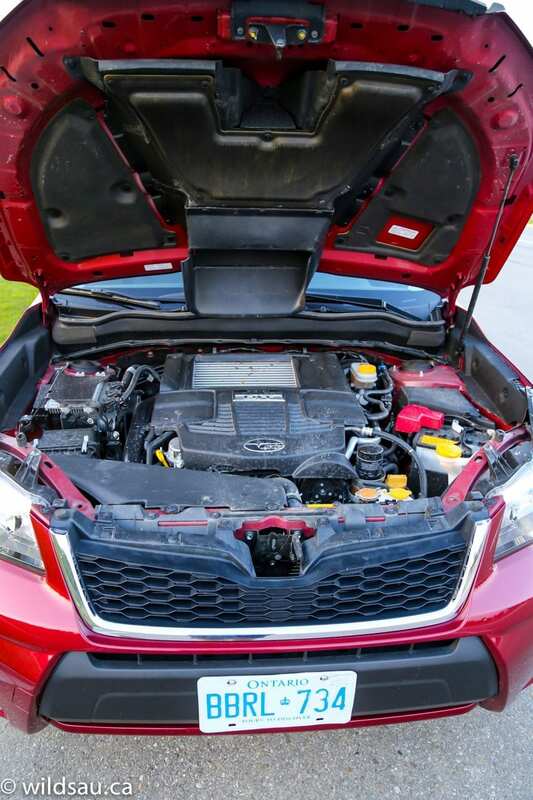 By the way, you can run the XT harm-free on regular fuel with the loss of only a few horsepower. A few people bemoan the loss of the hood scoop. But the best part is that there is still significant air routing happening under the skin, without the boy racer scoop. Check it out! 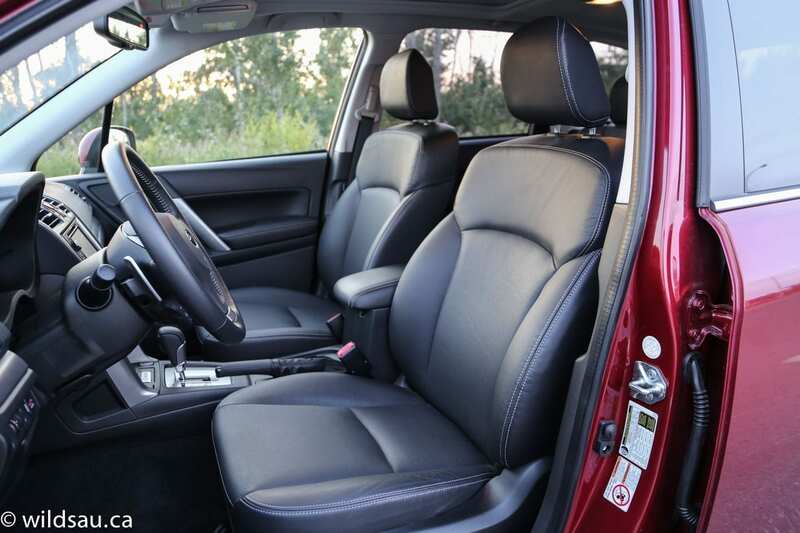 The Forester’s interior got a make-over too. And it is gorgeous! Kidding. I was just seeing if you’re paying attention. The styling is pretty tame – there’s nothing exciting going on here but everything works well. The materials however, have seen significant improvement. 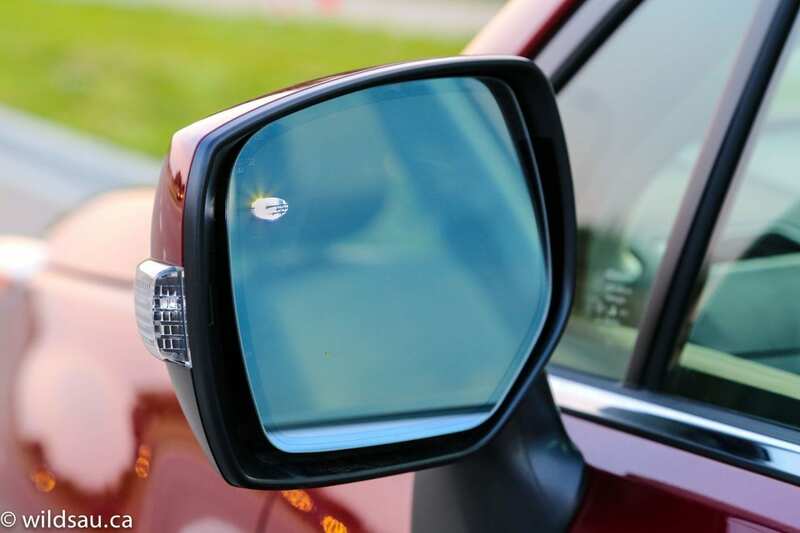 The dash is made of soft plastics and you’ll find touches like handsome stitched and perforated panels on the doors. Once inside, you’ll likely find the cabin spacious – the headroom was great for my 5’10” frame, even with the gargantuan sunroof overhead. The front thrones are a pair of heated leather seats, I found them very comfortable. They were firmer than I expected and were definitely lacking support and to top it off, I found them a bit slippery. The driver’s side is power adjustable. I really enjoyed the feel of the steering wheel. 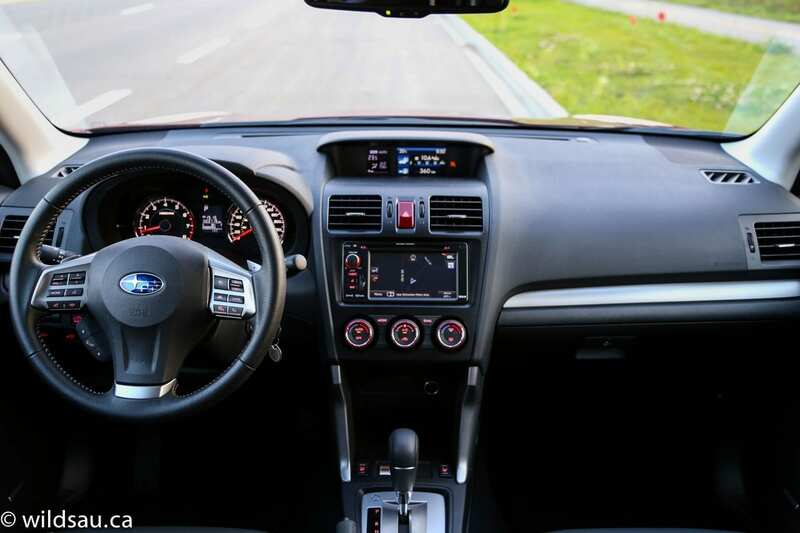 It has a lot of work to do – you can control the phone, handsfree, media, cruise control, driver information screen and the two drive modes with it. Behind it is a pod with two basic gauges, separated by a small screen with the trip meters and your fuel gauge. In the high center of dash is a small driver information display – a crisp, easy-to-read 4.3-inch colour screen (that handles fuel economy, clock, outside temperature, maintenance reminder and other customizable settings). Below it is a larger 6.1-inch touchscreen that manages your media, navigation and phone functions. It works fine, but isn’t given the most user friendly layout. It’s also not the sharpest screen out there but that’s not the biggest issue. The voice recognition system is simply hemorrhoidal to use. It’s a 4-step process to make a call, where other manufacturers achieve the same thing in a single step. 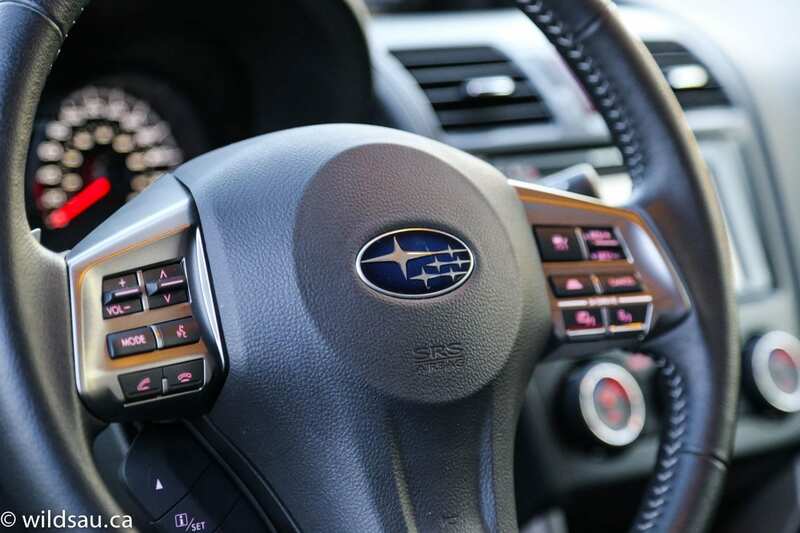 Subaru still has a way to go with this technology. 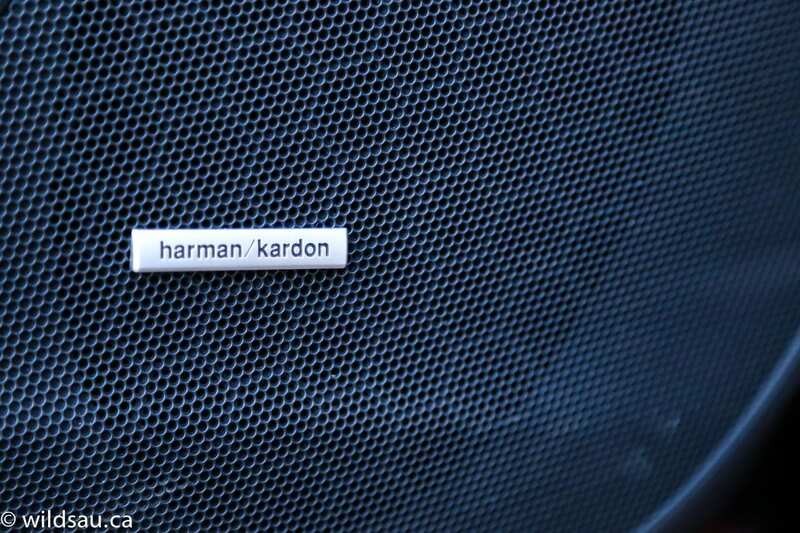 The 440-watt 8-speaker Harman Kardon sound system feeds off AM, FM, CD, auxiliary, USB and Bluetooth streaming sources and sounds fantastic! Below it sits a dual-zone automatic climate control system controlled with three rotary dials. The center console is home to the X-Mode button, the gear selector, a parking brake, two cupholders and an armrest. 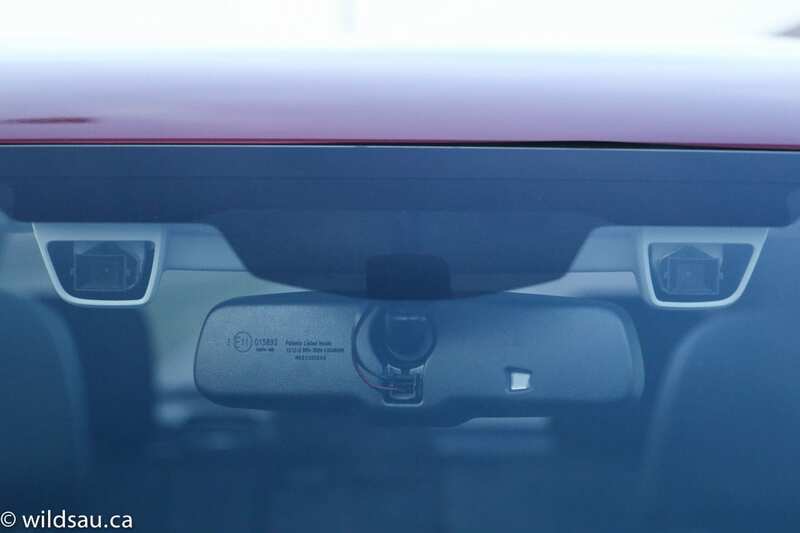 Overhead, surrounding the rear-view mirror, are two bulging camera pods. They hold the EyeSight cameras, which bring a bunch of driver technology to the game. Pre-collision braking, pre-collision brake assist, pre-collision throttle management, adaptive cruise control, lane departure warning, lane sway warning and lead vehicle start alert all come out of those little cameras. Thankfully, lane departure and forward collision warning can be turned off as they can get a bit irritating in the city. Unfortunately there are only buttons but no indicator to confirm you’ve turned them off – no light, nothing shows up on the screens. 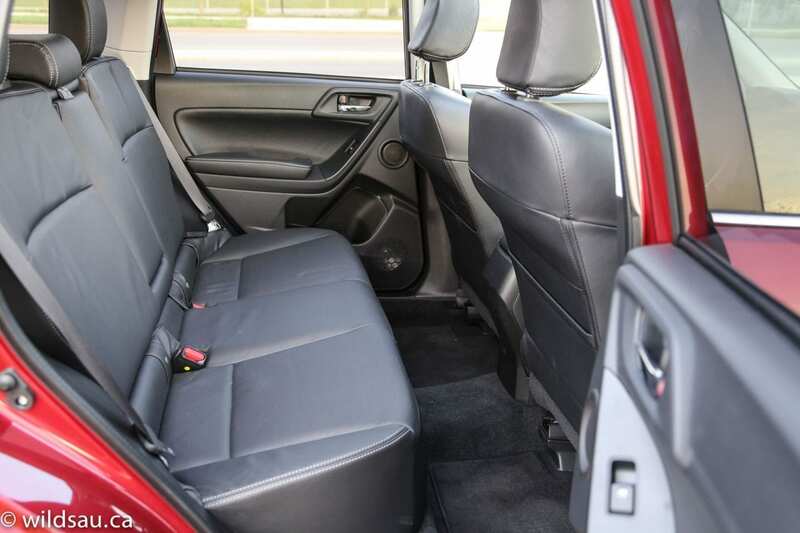 The back seats are very comfortable and the rear passenger compartment feels equally spacious. Legroom and headroom are excellent and things seem airy with the large panoramic roof. The seats are lovely but there’s little else going on. You get two seatback map pockets and the middle seatback folds down to become an armrest with a couple of cupholders. That’s it. No air vents, no charging plugs, nothing. And frankly, I think that’s a bit weak when you’re sneaking up on 40 grand. Typical for most cars, and no different here, the middle seating position is a drag for adults – the fact that it straddles a tunnel on the floor doesn’t help matters, as anyone sitting there can’t put their feet in front of them. All three of our kids fit back there quite well, and there are two sets of LATCH anchors for their seats. Up front, you get a reasonably sized glove compartment and door bins, and there’s a convenient open drop-in bin with a 12V plug below the center stack. I liked the carpeted bin under the armrest – it also houses auxiliary, USB and 12V plugs. Old Forester owners will be excited to hear there’s a power liftgate. Finally! 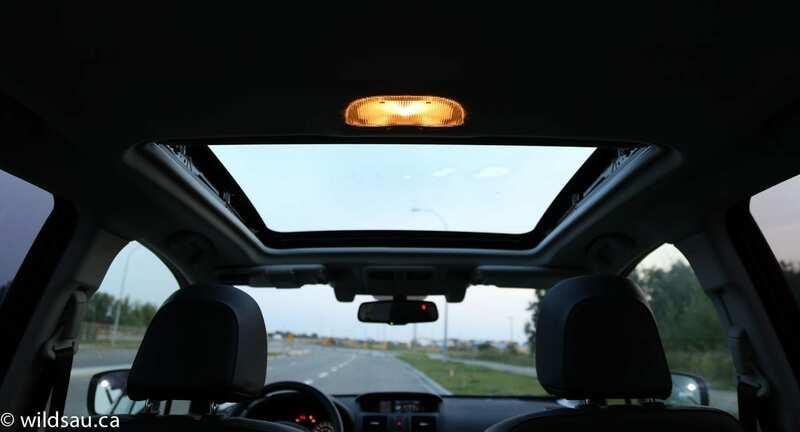 It can be activated from the dash, your key fob and on the trunk lid itself, and it can also be set to open to 3/4 height for lower parkade ceilings. 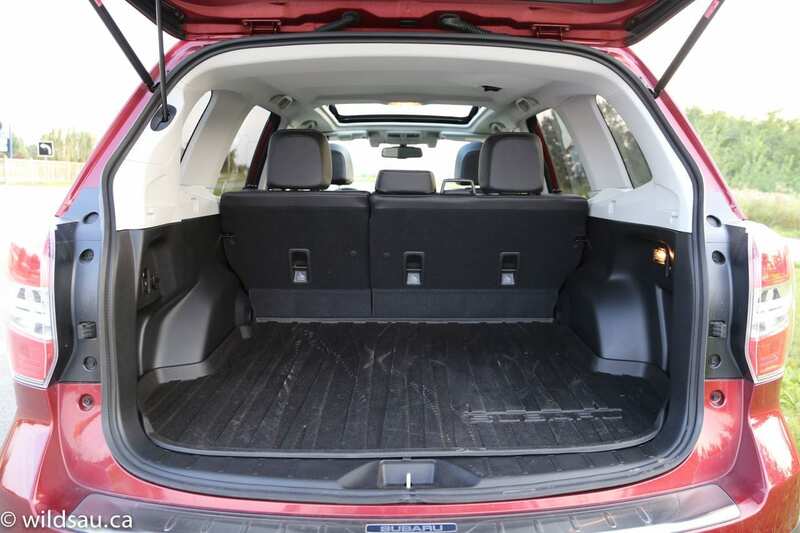 Subaru really raises the bar with the cargo space – 974 litres of room greet you when you pop the trunk. The trunk is appointed with a 12 V plug, nice tie downs and underfloor storage (including space for the included removable, retractable tonneau cover). The 60/40 split rear seats have convenient power releases, allowing you to quickly fold either side from the trunk – fold the seats down and you have a class-leading 2115 litre space. OK, well let’s get back to that CVT, shall we? Clearly the engine has what it takes on paper. Well, the CVT is nothing if not a good partner for the turbo. Off the line, it’s smooth but snaps to attention with authority. Stand on it, and it winds out, reaching rather high speeds quicker than you’d think possible for a big vehicle like this. During every day driving, I found the transmission to be very intelligent. It does take a second or two to get to the right ratio if you punch it if you’re driving in the “I” mode, which is basically normal/eco driving. But that’s where the SI modes come in. Put it in SI (Sport) mode, and the car’s responsiveness sharpens. 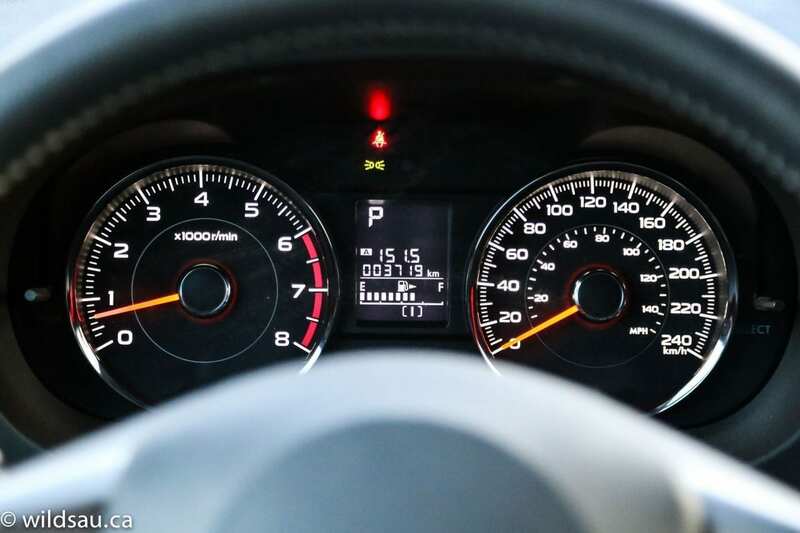 Choose the even more radical S# (Sharp) mode for further throttle sensitivity – it veritably leaps ahead at any speed, and “downshifts” quicker than any automatic transmission. Speaking of, the CVT can be shifted manually with the paddles – in the S modes, those simulated gears are found in a split second. It’s very impressive technology and it works! Handling is simply amazing for a vehicle this tall and large. 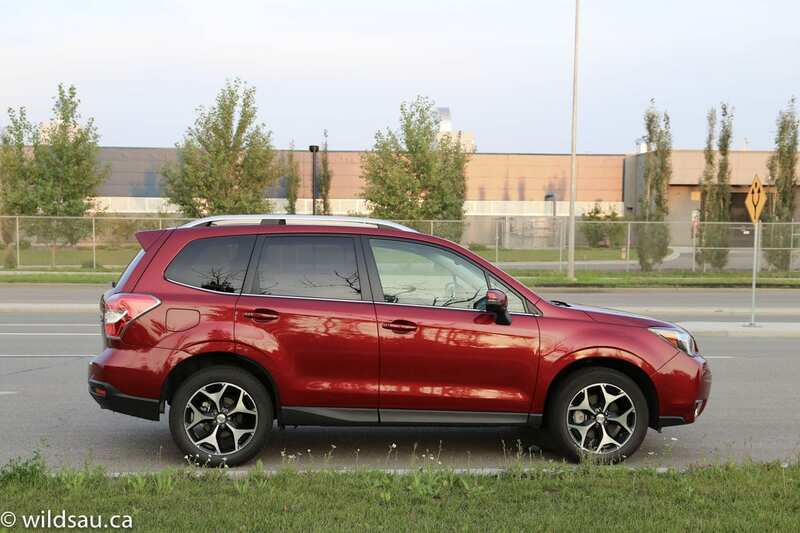 Sure, the height of the Forester shows up – there’s roll around corners, but it grips with absolute jurisdiction in every single driving situation. The all-wheel drive is transparent during basic driving, but it doesn’t take much for you to feel the difference. 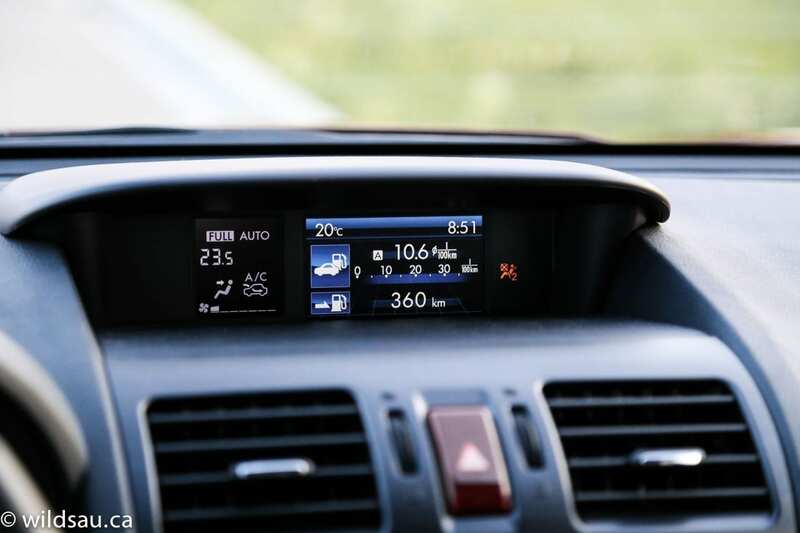 It is an excellent system, and keeps the car feeling balanced, planted and in control. Put the Forester through the wringer, and there is no question that it is shifting the power to the exact place you need it. To call it confidence inspiring is an understatement. You can throw this SUV into any curve or any corner and you know you’re coming out of it just fine. Though firm, the suspension is very well tuned, soaking up big hits while never wallowing around corners. I found it to be a good balance. Not only that, but it allows you to head off the beaten path. 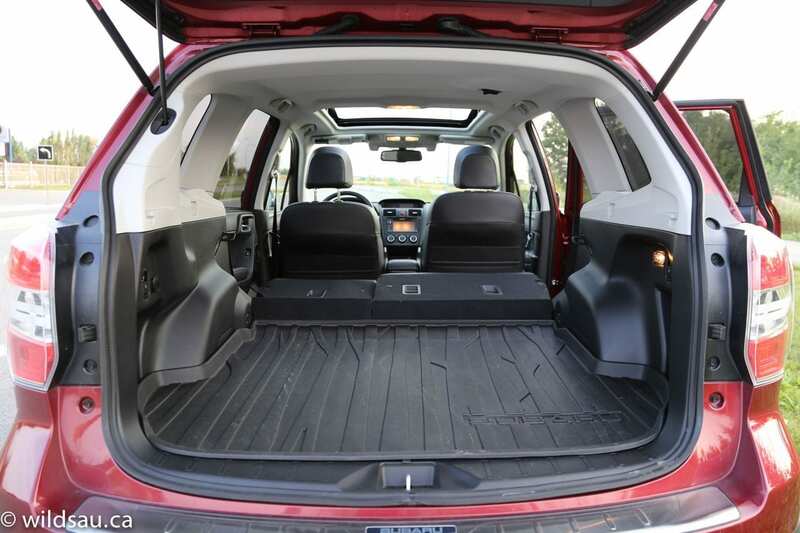 The Forester has 220 mm (8.7″) of ground clearance, more than most of the SUVs that come to mind. Pair that with X-Mode, a low-speed off-road mode, and you’ve got an SUV capable of taking on some significant off-roading duties as well. 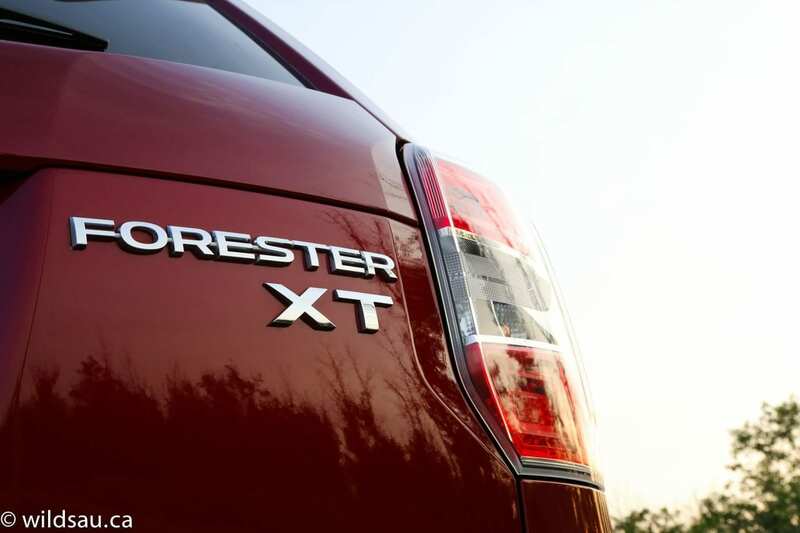 We found the Forester excelled as a highway car as well. It stays quiet and the suspension is smooth and comfortable. Braking is powerful and effective, and visibility out of the car is excellent. 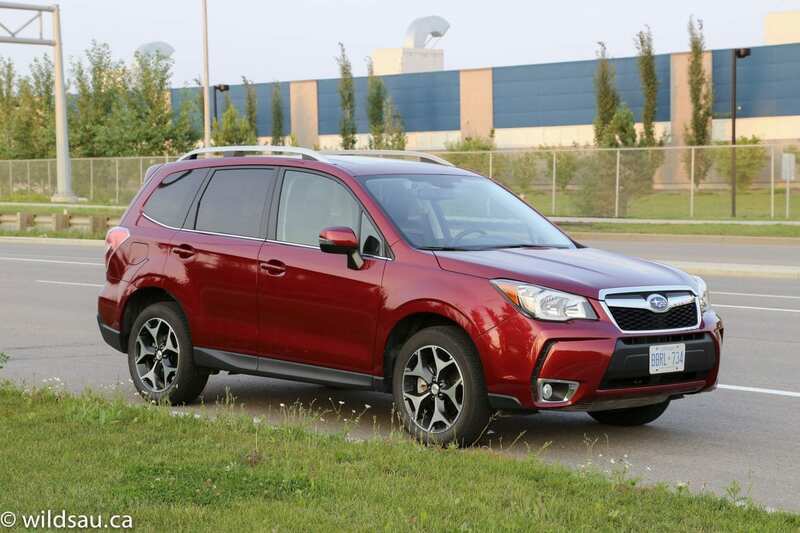 As capable as it is, the Forester ends up blurring all the things it does really well together, because on top of all that, it’s a fun car to drive! And that’s a rarity in this class. At this price, I think the passenger seat should be power adjustable. C’mon, Subaru. Much like the lack of amenities for rear seat passengers, this just comes across as cheap. I giggled at what are probably the tallest, and possibly the narrowest, sun visors I’ve ever seen – they work perfectly fine but their dimensions will take you for a surprise the first time you fold them down. 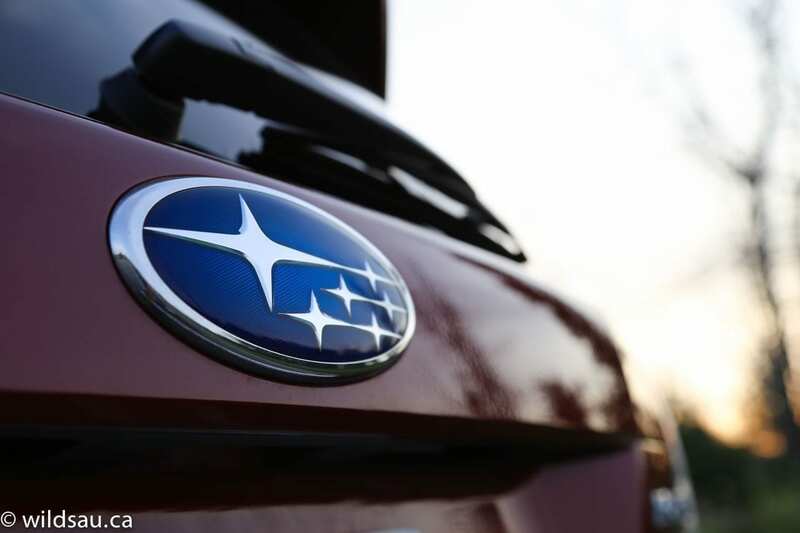 A cool detail – the sideview mirrors have a bright LED light that shines through a Subaru logo – which in turn lights up the side of your Forester when you unlock it at night. Love it! 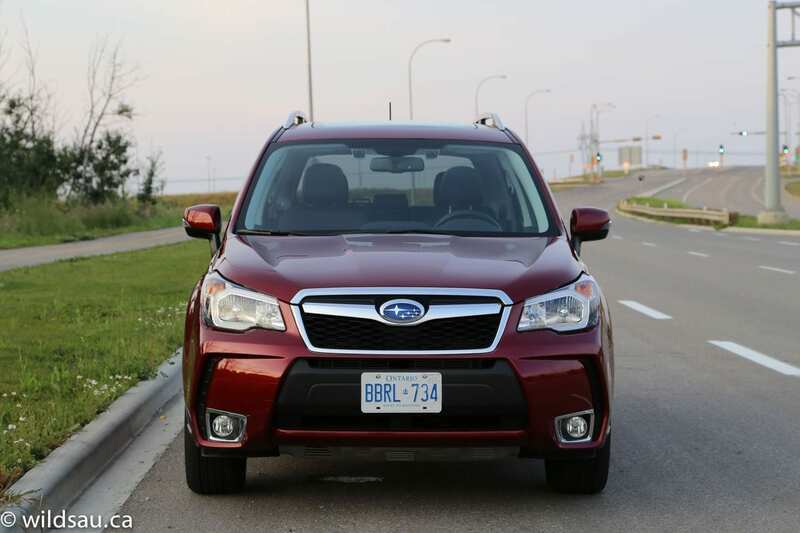 I give the Subaru Forester an 8.5 out of 10. So what’s not to like? Well, WAF (Wife Acceptance Factor) was, sadly, not as high as I’d hoped. She wasn’t a huge fan of the styling, inside or out. And that matters a lot to her. She admitted that it was a great car to drive though, and she did love that she could knock off an entire day at the mall and still have room left over in the trunk. 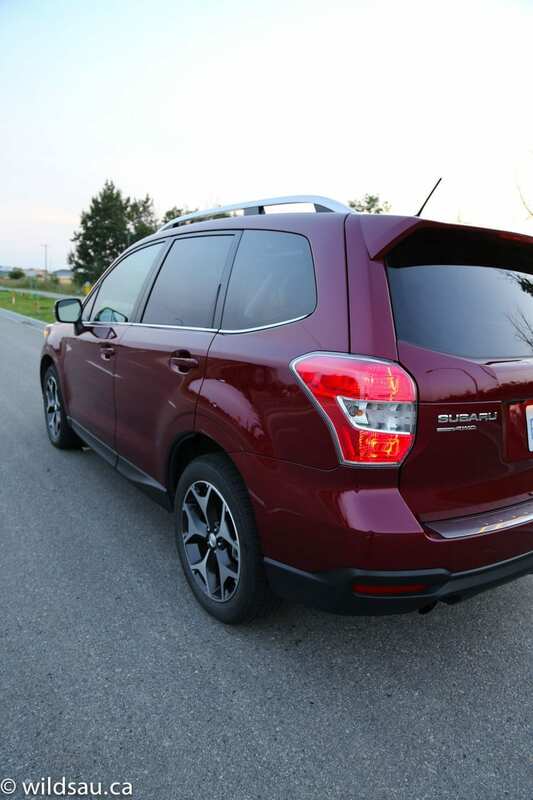 A few months prior to this review, I was able to give the 2014 Forester a go in B.C. If you are interested in my adventures, check them out here.